A senior BBC producer has been barred from re-entering Israel over his alleged role in an interview of nuclear technician Mordechai Vanunu. Israeli authorities are refusing to renew Simon Wilson's visa, preventing him from returning to his post as deputy chief of the Jerusalem bureau. Mr Wilson is accused of deliberately defying Israeli law by not submitting the interview to the authorities. The BBC has said it sees no reason why Mr Wilson should be refused entry. He has not returned to Israel since his visa expired at the end of last year. Mr Vanunu served 18 years in jail for disclosing details of Israel's nuclear programme, and was released in April under strict conditions. 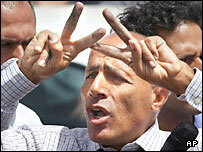 Mr Wilson was acting bureau chief when a private production company interviewed Mr Vanunu for the BBC in May 2004, shortly after his release. Israel says military and Shin Bet security service officials called Mr Wilson requesting to see the interview before it left the country in case it contained material sensitive to national security. The BBC is seeking to clarify the situation with Israel in the hope of finding a quick and amicable resolution. A BBC spokesman said: "We can see no reason why Simon Wilson's visa application should be turned down, or why he should be denied permission to re-enter Israel to resume his duties. "